Abdo Educational Publishers have released Harry Houdini: Illusionist & Stunt Performer by Grace Hansen. The book is part of the publishers "History Maker Biographies Series" aimed at pre-schoolers grades 1-2. The name Harry Houdini is a household one and synonymous with magic and the art of disappearing. Yet, few know the real story of this entertainer and illusionist. This title will teach readers more about Erik Weisz and how he came to be known as the great Houdini. Complete with a timeline and wonderful historical photographs. 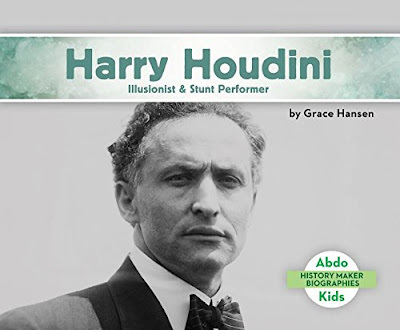 Harry Houdini: Illusionist & Stunt Performer can be purchased at Amazon.com (U.S.), Amazon.co.uk (UK) or the Abdo website. And another photo I'm not familiar with! This photo had popped up just lately. I believe it's from Getty Images. It had been a while since I've seen an unpublished HH photo. He looks serious in this one and just had a haircut. Could be right after he had that wild grey bush in 1914-1916. Good observation about the hair. But Houdini had those grey temples as early as 1908, so it's hard to say if this is pre-bush or post-bush. BTW, his long hair style appears to have made it all the way into 1918 and into The Master Mystery. He appears to have gotten a haircut midway through filming. This photo also seems to match the well known profile photo with the bowtie and grey temples that I believe HH used at one point as his stationery. I was dismayed to find out recently that my ten-year-old nephew has no idea who HH is. It turns out to be a hard thing to explain! Maybe you do have to get 'em in preschool. This month I'm going to speak to a grade school class about Houdini. I'm curious (and a little terrified) to ask how many of them have ever heard of Houdini. Just to follow-up on this comment. The kids not only knew who Houdini was, they knew who J. Gordon Whitehead was! However, they didn't know who David Copperfield was. FYI, this book is set to be released in Spanish in Dec. I didn't discover HH until I was ten so your nephew is just at the right age. He's old enough right now to have his curiosity fired up. Inform him that HH was the man that no lock could hold, and go from there.